If you drive to campus, chances are you’ve passed it many times, but tend to avoid stopping due to the lack of parking and the number of people who seem to be loitering in and around it. But the small shopping center on the northeast corner of Avalon Boulevard and Victoria Street, which is anchored by a 7-Eleven, has a couple of hole-in-the-wall restaurants that students should definitely check out. Located across the street of the campus’ marquee by the StubHub Center, Big Burger and Louisiana Hometown Seafood Fish and Tacos are both affordable eateries that offer completely different menus. Now, neither of them is going to be mistaken for a five-star restaurant. 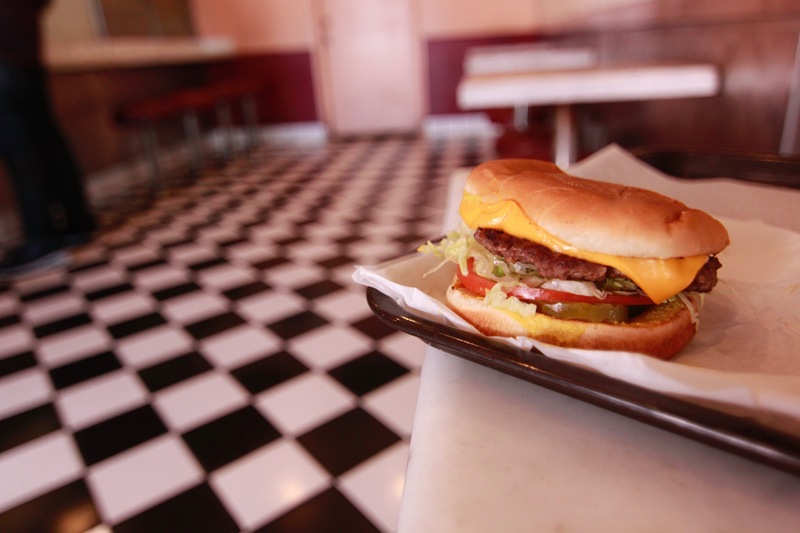 The interior of the Big Burger is reminiscent of a 1950s diner that doesn’t look like it’s been upgraded since then. But the food more than makes up for the lack of ambiance. It’s a simple menu that you could call souped-up American fast food, including burgers, sandwiches and a small selection of salads. Most of their combos, which include fries and a soft drink, are less than $9 and most burgers and sandwiches are less than $5, including an egg sandwich that clocks it at less than $3. I ordered the pastrami combo, at $11, but considering the pastrami is stacked so high I could barely fit it into my mouth, it’s worth it. The 1/3 lb. turkey cheeseburger at $3.58 is the most popular item on the menu, according to the manager. Right next door to Big Burger is Louisiana Hometown Seafood Fish and Tacos. Again, while the interior doesn’t scream fine dining, it can get very busy around lunchtime, mostly because all their lunch special combos are under $7. I ordered the fillet of red snapper with three pieces of shrimp for $6.39, which came with French fries, bread and a small salad. This was some of the nicest seafood I have had in a long time. The way they fry the fillet leaves a really crispy surface, yet the meat inside almost falls off the bone. Along with the combos, which include sole, tilapia, catfish and other seafood, such as oysters, a number of sandwiches are offered, ranging from the $4.59 sand dab sandwich to the $7.99 snapper sandwich. You can also order just the seafood, such as eight pieces of red snapper for $11.99, orange roughy for $14.99 or shrimp orders ranging from $7.99 to $16.99 for 40 pieces. If you’re throwing a small party, you can order the most expensive item on the menu, which includes 15 pieces of jumbo shrimp, one jar of oysters, a half-pound of scallops and French fries, salad and rolls, for $45.99. Southern-infused comfort food sides are also offered, such as hush puppies, potato salad and macaroni salad. If you don’t have the time to wait for a burger or seafood, then consider 7-Eleven. Sure, the hot food it offers varies widely throughout the day and night, depending on when it was pulled from the oven, but there are eight items offered, including burger sliders, chicken tenders and pizza. The food is usually disappointing, and the portions are small, but for $10 you can buy any three items. (But, between you and me, you’re better off going to one of the two neighboring restaurants. Now, about those people. Since 7-Eleven is open 24 hours and sells alcohol, at night the center can be a little dicey. And even in the day, since it’s located right by several bus stops going in all four directions, there are always people who seem to be loitering nearby. And rarely have I ever stopped there and not been approached by a panhandler. So, use common sense and maybe go there with a friend or two. I’m not saying everyone you encounter there will be aggressive, but it’s better to be safe than sorry. And the food is too good at both eateries to be scared away. Big Burger, 17940 S. Avalon Blvd, 310-532-3715; usually open until 10 p.m., 11 p.m. on Weekends. You can call ahead and pre-order. Louisiana Hometown Seafood Fish and Tacos, 17944 S. Avalon Blvd., 310-538-5889. Open until 8 weekdays, 9 on Sat., closed on Sundays.